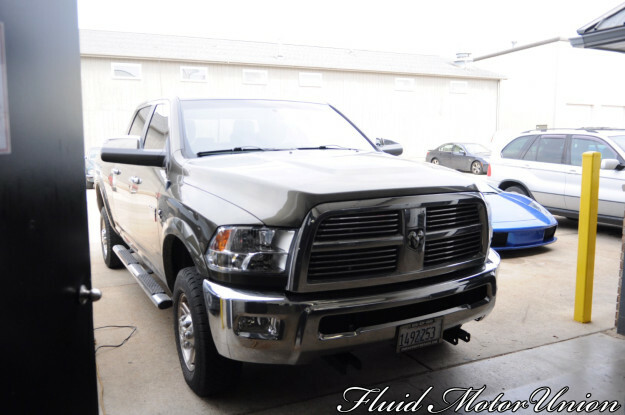 It’s common knowledge there are a plethora of exhaust options for the Dodge Ram 2500. So when a client came in asking for something unique to add to his Dodge Cummins truck, we had a vision in mind. We had already been dreaming of building a system for a diesel rig this was perfect timing all around. Our plan: side exit double-barrell shotgun style! 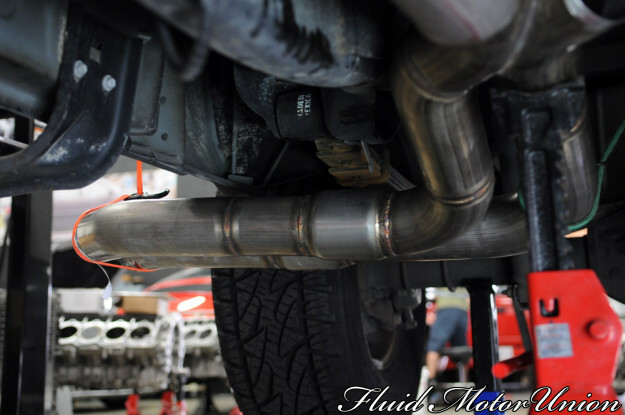 As you can see below, we fabricated a custom exhaust beginning at the cat eliminated downpipe. 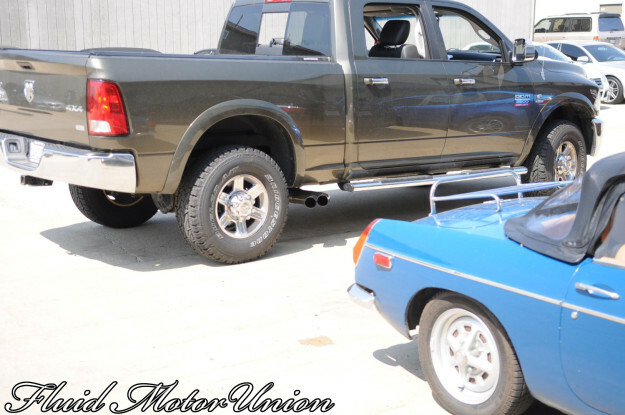 As we’re sure some of you know, the turbo does a good job of quieting things down, so we knew no resonators or anything beyond a simple muffler would be needed to keep sound to tolerable levels without sacrificing performance. At this point we feel compelled to say, ****This is for offroad use only! **** Our Cummins customer competes in the Illini State Pullers truck-pull events, so he needed the extra power to give him an edge during competitive pulls! 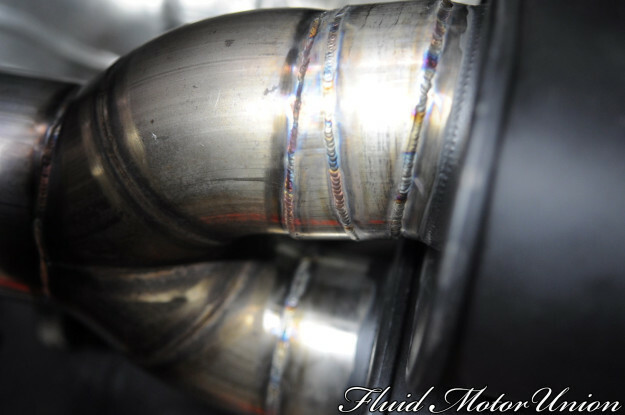 From the turbo we went with a stainless steel 4 inch single pipe that further splits into dual 3.5 inch pipes that come out just in front of the axle on the passenger side. We can assure you, because we’re the only ones who currently make this, there won’t be another like this on the road. Up top we went with the Sinister EGR Delete Kit. Sinister Diesel’s EGR Delete Kit is a complete replacement and thoroughly improves your stock EGR in a number of ways. First, the cover plate has been made from tough billet aluminum, making it many times more durable. 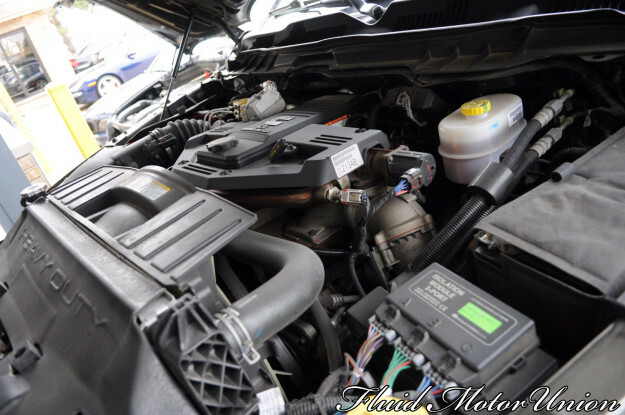 Second, it helps keep engine temperatures on the lower side by allowing coolant to circulate faster. 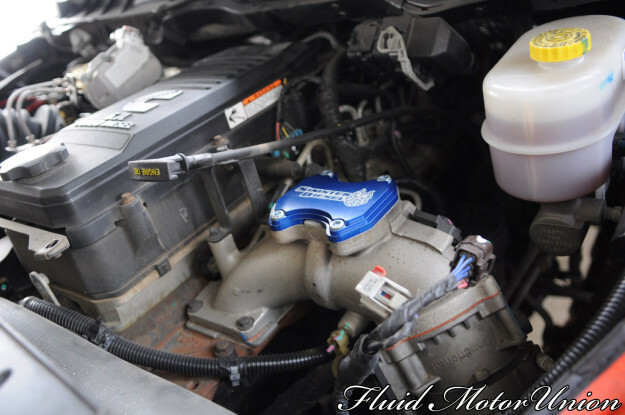 It goes without saying that lower coolant temps, in a diesel engine, equals more power! Lastly, the kit eliminates exhaust gases from recirculating through your intake manifold for increased reliability and efficiency. 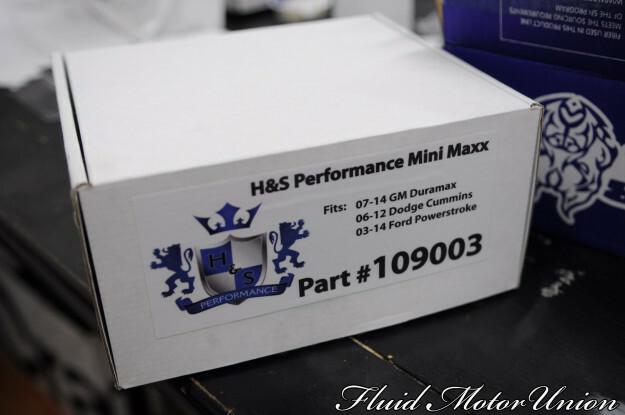 To finish this portion of the install, the Sinister EGR Delete requires a performance tune. Which brings us back into the cabin where we installed an H&S Tuner. The Mini Maxx race tuner offers everything a diesel owner could want in an all-in-one high-tech unit. Exclusive to H&S Performance, the Mini Maxx has the flexibility of shift-on-the-fly tuning, as well as giving you the ability to monitor vital engine statistics at a glance. The Mini Maxx comes loaded with 3 power levels that can be changed on-the-fly at any time. Supporting an updated tune, the H&S Mini Maxx comes with a transmission tune as well which allows for safer, seamless shifting. This is a must, given the heavy increase in power and torque from the unit. Taking the exhaust, EGR delete, and tune into consideration we figured an increase of roughly 125HP! 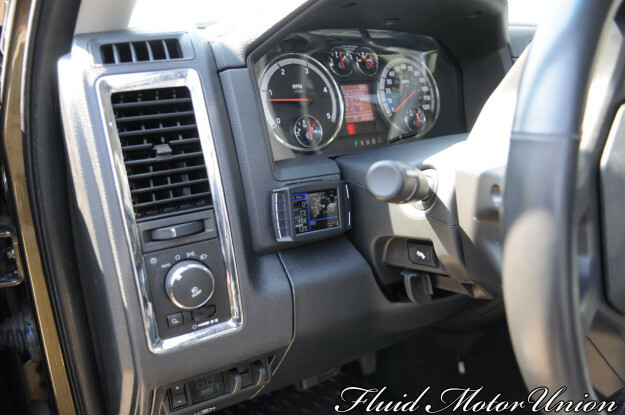 If your truck is in need of an upgrade, you may find a custom application is both economical and more pleasurable! Contact us via email, social media or by telephone if you have any questions or would like to schedule an upgrade consultation for your vehicle today! We are located in Naperville Illinois, off the route 59 exit of I88, next to Top Golf. 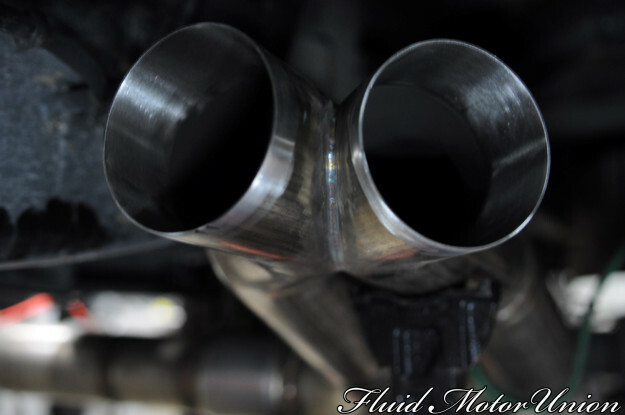 You can also reach us @ (630) 305-3054 or email info@fluidmotorunion.com!